View an extended gallery of renderings of Pier 6 and the planned Mantaray on the AN Blog. At the East River terminus of Atlantic Avenue, Brooklyn-based Michael Van Valkenburgh Associates has already transformed 1.6 acres of Pier 6 into a whimsical playscape of rocky crags and spraying water interspersed by lush plantings. 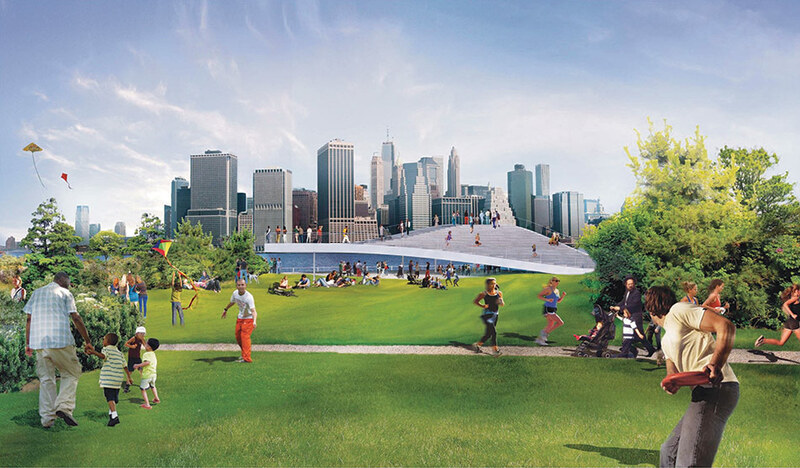 This landscape forms the southern anchor for the wildly-popular 86-acre Brooklyn Bridge Park (BBP). Now Van Valkenburgh is teaming up with Bjarke Ingels, founder of BIG, to complete the landscape and add an architectural statement at the pier. 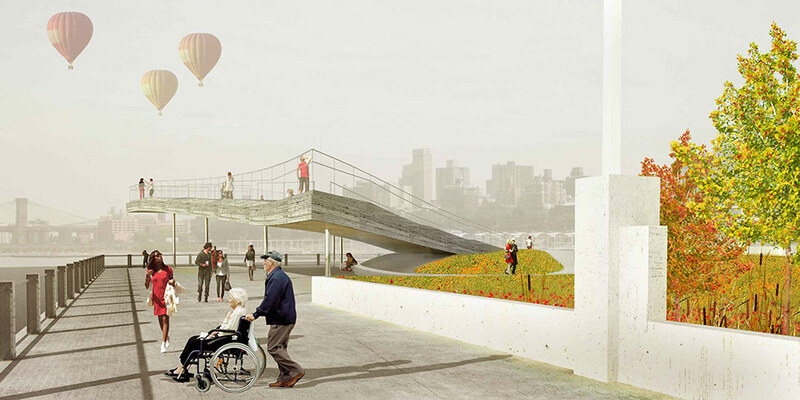 Van Valkenburgh’s new landscape is intended to be more pastoral and less programmed than the first half of the pier, building on the most successful elements of the rest of the park. “We wanted a large lawn at the end of the pier. We learned from the success of Pier 1 that people like to gather,” Regina Myer, president of Brooklyn Bridge Park, told AN. 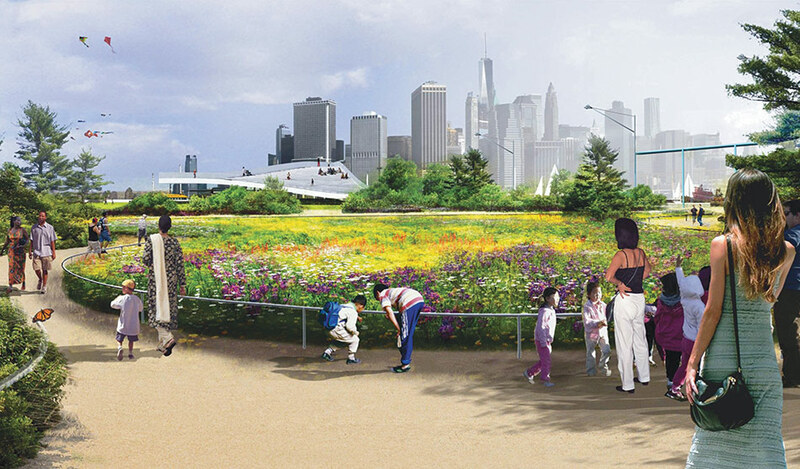 Surrounded by a wide promenade at its perimeter, the design for Pier 6 includes a broad lawn for large events connected to land by a green swath flanked by densely planted beds that act as acoustical barriers. In the center of the pier, a field of indigenous flowers serves as a focal point uniting the landscape. 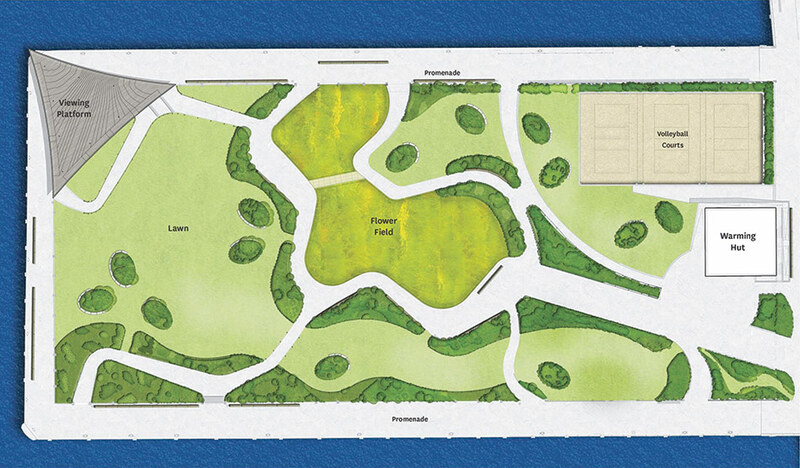 Myer said the flower garden will be planted with an array of plants that give it three distinct seasonal shows of color. The 6,000-square-foot Mantaray will be fully ADA accessible and clad in timber slabs chosen to withstand the harsh waterfront elements and to create a sense of texture and color. Because of the structure’s weight, Myer said some additional structural support will be required to build the viewing platform. No financing is in place for Ingels’ $8-million platform, but funding for the landscape—estimated between $13 and $15 million—is in hand. If funding for the platform cannot be found, Myer said a series of shade structures could be included in its place.